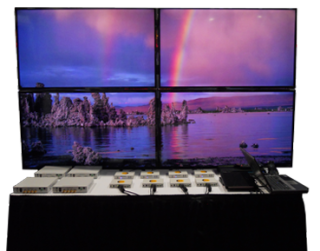 The What: Opticomm-EMCORE will be using the InfoComm 2014 show in Las Vegas on June 18-20 as a platform to demonstrate the quality of the new Eclipse HD as it extends and switches 1080p or 1920x1200 multimedia feeds across a dedicated IP network, sent to a four-panel video wall as example of its capabilities. The What Else: Opticomm-EMCORE will construct a cost-efficient video/audio/data distribution system over an IP network to show design consultants, system integrators, and home theater aficionados the painless switching and routing of the new Eclipse HD. This encoder/decoder system provides visually lossless transmission and processing of HDMI 1.3, 5.1 channel audio, RS-232 data and USB HID keyboard/mouse (KVM), over a dedicated Gigabit Ethernet network. A media player, Blu-ray or DVD player, laptop, camera or other HDMI source can send HD signals to the Eclipse HD encoder, which can then be sent to a Layer 2/3 Unmanaged Gigabit Ethernet Switch with IGMP 2.0 (if desired), which lastly can be received by one or more decoders to be connected to single or multiple displays. There are virtually limitless ways to configure a HD matrix by stacking IP switches. In addition to the Eclipse HD, we will be showing the NV series as a part of the IP network exhibit, which utilizes JPEG 2000 encoding and decoding for lossless DVI, HDMI, and 3G HD-SDI distribution. Also we will also be highlighting, in our booth, the c-linx series, Optiva and GBOX fiber products. The c-linx series are small, stand-alone box units utilizing HDBaseT technology to extend signals for extension up to 100 meters, over Cat-x. The company will also display the Optiva OTP-1DVI2A1UKM, which has been upgraded with a larger bit-rate of 10GB optics and now supports up to 4K resolution and KVM over a secure, lossless multimode fiber up to 10 km and singlemode fiber up to 25 km. The first in the GBOX Series, GBX-HDMI-VGA, provides for the transmission of either HDMI 1.4b with HDCP and HEAC support, or VGA /component for legacy stereo analog sources, in a point-to-point configuration. It also supports stereo analog and S/PDIF digital audio, 10/100/1000 ethernet, bidirectional RS-232, and IR support.